What is the best training single scull for rivers and lakes? The best training single scull for rivers and lakes we have at the Coastal Rowing Centre is the LiteRiver 1X. Why do we have it at the Coastal Rowing Centre? Because we also row it on the sea. It is 5.5 metres long , 0.6 metres wide and 0.32 metres deep; it can be made from carbon fibre or fibre glass and weighs around 18.5Kg or 20.5Kg respectively; so it is very easy to handle. There are two versions of the LiteRiver 1X; one for lighter rowers between 40Kg and 75Kg and a larger version which has more volume and is suitable for rowers over 70Kg. Both boats are quite capable of reaching 8 knots. For more information and videos please go to www.liteboat.fr. Technically it sits between a beginner’s scull, like the LiteSport 1X which is wider and more stable, and a fine river competition scull, which we know can be a little unstable. The LiteRiver 1X is great for building confidence and learning the rowing technique. 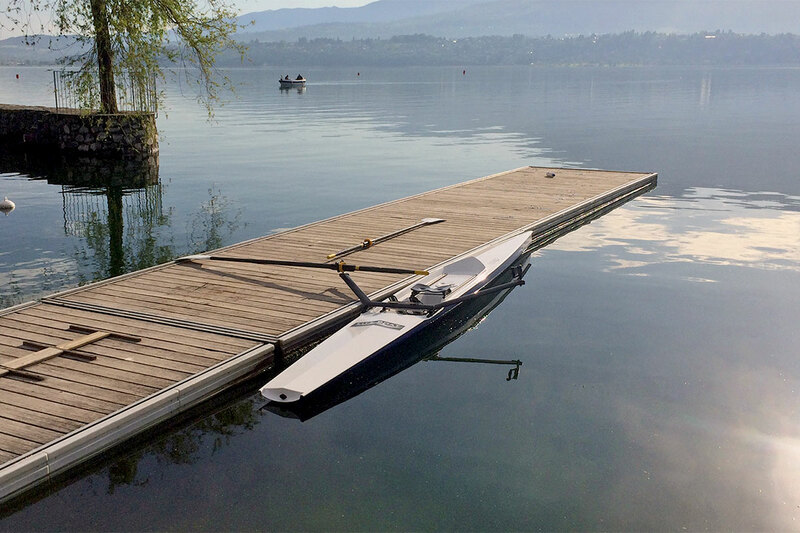 LiteRiver 1X is also popular with leisure scullers who just want to glide on the open waters of a lake or on the river. At the Coastal Rowing Centre we also use it as a coastal boat as long as the sea isn’t too choppy. As with other Liteboats, the LiteRiver 1X comes with a removable wing rigger system, with quick release pins so it only takes a few moments to put the rigger on and take it off. With the riggers off it is easy to load on to your car and much easier to store. Optional extras include a large storage hatch, which I recommend, it is great for storing a fleece, splash jacket and water bottle, when are off the water it helps to ventilate the inside of the boat when left open. Contact Coastal Rowing Centre, Studland Bay, Dorset. WHAT IS THE BEST SINGLE COASTAL ROWING BOAT?